Perfect backing paper for the dresses. Never used the bead swirls so no idea! 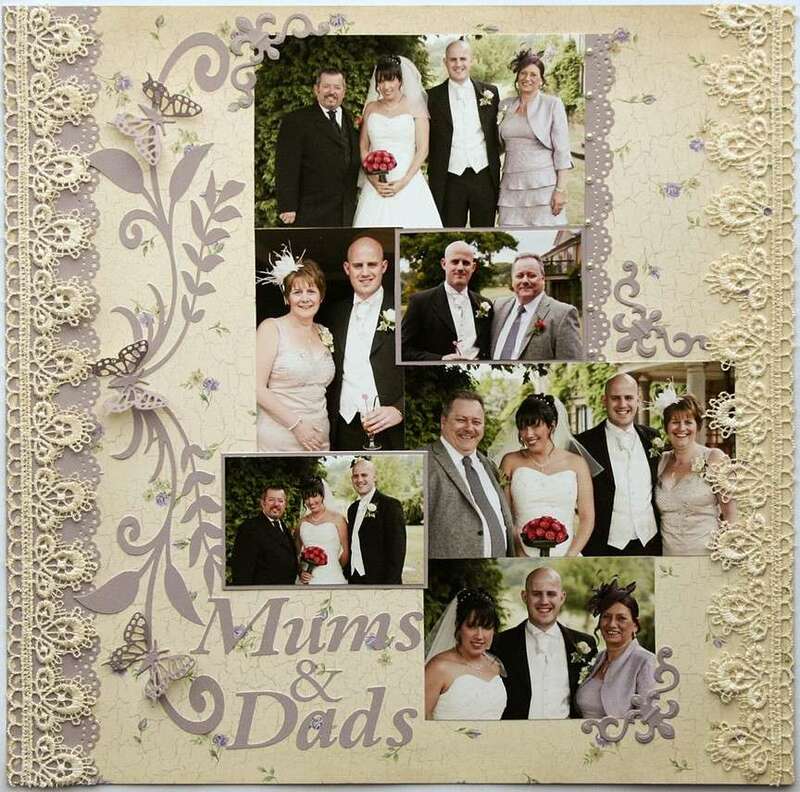 aww beautiful coloured page... didnt she have a lot of bridesmaids, goodness! and the pearl swirl was worth the effort and adds something and looks lovely, I dont know how you get them off whole, I am too mean to use them whole! Wonderful page Lorraine, as said colour just right for the dresses. These pages just get better and better. What make is the die cut with the flower on top of it please. Love the colours of this page. Smashing embellishments. It's an electronic cut Scatty, not a die. Sorreeeee!! The hearts are Cheery Lynn, the bird is Marianne and the papers are Kaisercraft. The two lates pages are fantastic, especially the green one, pearl swirls are a pain but I tend to peel them off gradually and attach them to the paper as I go, still no guarantees which is why I have a few and think 'they are pretty' but don't do anything with them! Love this page, beautiful colours and the hearts are great. Love the lastest two pages. The bridesmaid one is beautiful , lovely colours. Don't think I like this one. Too busy maybe? Not sure I was in the right frame of mind yesterday to be scrapping. I know what you mean Lorraine, I do like it but its not your usual style. I love the swirls are they done with your new machine the robo or a die? 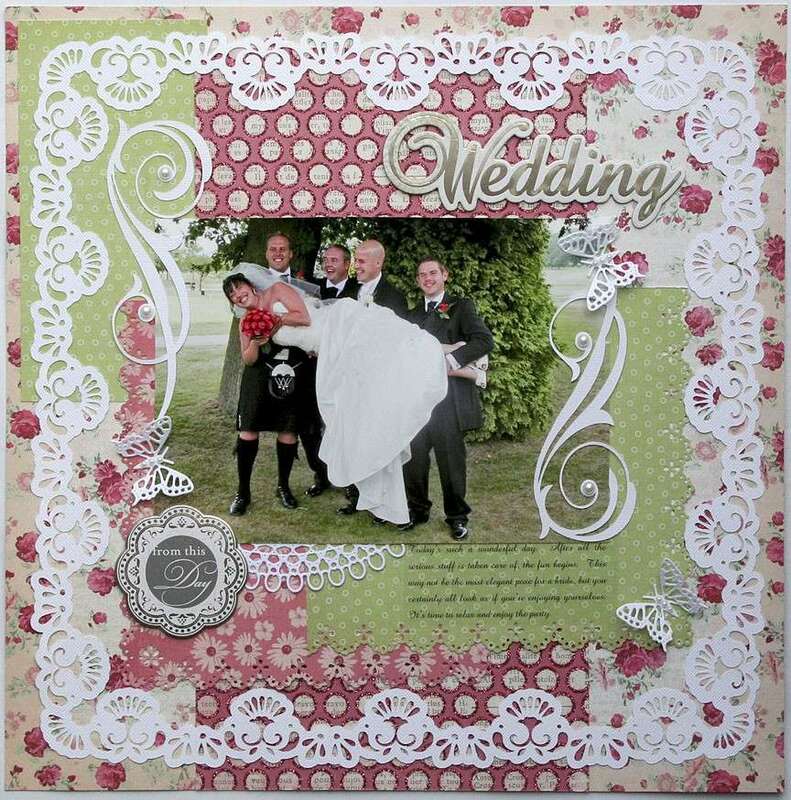 I think its the lace border thats a bit to much but otherwise a really lovely layout. It is a bit fussy for your work, I think one too many pink flowery papers. We are picking it apart for you Lou! lol. The swirls are simple and very elegant. Lovely photo. LOL I like the lace border, it's the pink spots at the top that I think maybe too much, a bit of vellum over it? Perfectly acceptable though and makes the others look even better, there is always one you don't like so much. You pick it apart as much as you like, lol. I don't like it and I think it's the frame too and the background paper is too much and maybe the green isn't right either!!!! I'll be re-doing that page. Swirls are Cameo cut Alison, as is the frame. I'm happier with this one. Oh, and for any of you that don't know, if you click on enlarge image top left of pic, you'll get a full size view. i love the lo with lots of florals in it and would not change any of it . i know its a little busier than you would normally do lorraine but id not change any of it . liking the last one too. The new one is more you Lorraine, I like the use of the black as it really makes the page stand out. If you do do the other page again keep the swirls, LOL. I dont see whats wrong with it, it isnt your normal style no, but variety makes a good book and your worst page is still better than my best! Yes, back to the top class stuff we're used to now, you see when you are as good as you are, then an average LO that the rest of us would be perfectly happy with is just average. Looking forward to seeing it after too. 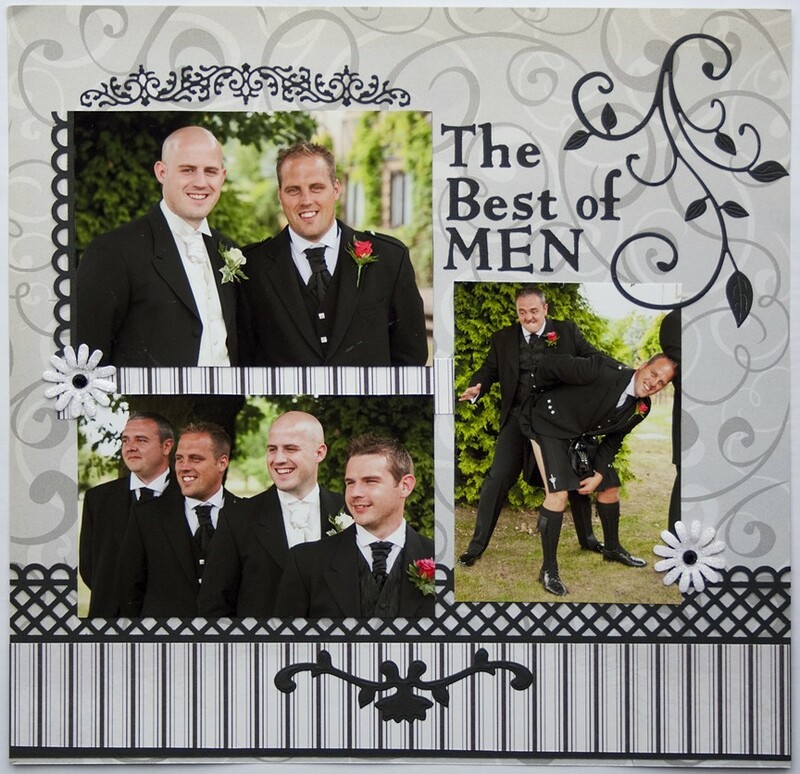 Lovely, the colours are perfect for male themed page.